Club Impact, social club for young adults with disabilities, celebrates six years! “Last night we celebrated our 6th anniversary with pie, ice cream and participant testimonials. I had no idea how moving this would be,” said Ralph Gilliam, Impact NW’s volunteer who runs Club Impact. 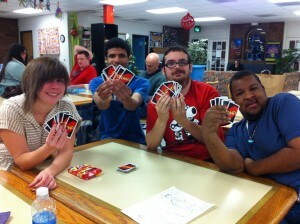 Club Impact is a social club for young adults with disabilities. Club Impact meets every Monday night from 6-8pm at the SE Multicultural Center at 4610 SE Belmont St.. Participants are welcome to drop by as often as they wish for all or part of a session. For more information about Club Impact, contact Ralph Gilliam at (503) 453-6412.